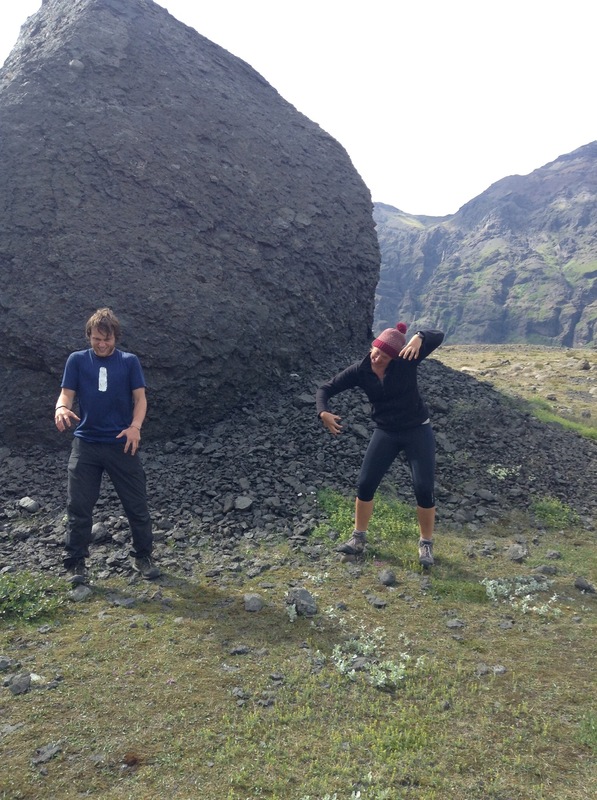 As holiday week commenced, Iceland showed her mighty power changing from the beautiful heat to a storm approaching. Dust clouds were being kicked up by strong winds through the valley, impressive plumes of the dusty soil spiralling. With Iceland’s debut into the Euros, football fever was high and 10% of Iceland’s small population was in France. Having drawn with Portugal many hopes were posted on the team as we watched them play against Hungary on a big screen with buffering Internet and on our weekly trip to civilisation. It only added to the atmosphere that we could hear the cheering of the goals 5 minutes before the showing caught up. 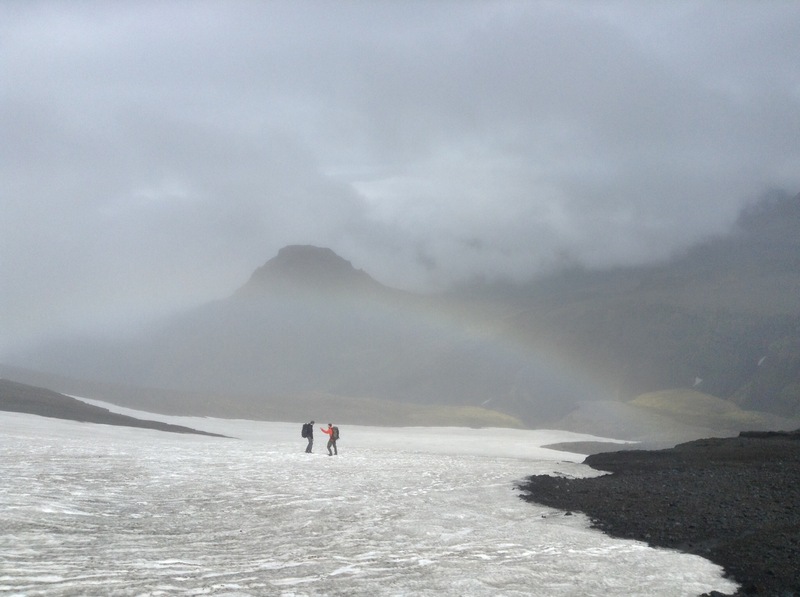 We had planned to hike up the mountain hut on the newly formed glaciers of Eyafjallayokull on the Sunday however a severe weather warning promised 20metres per second gusts and tackling a ridge walk suddenly didn’t seem so fun. 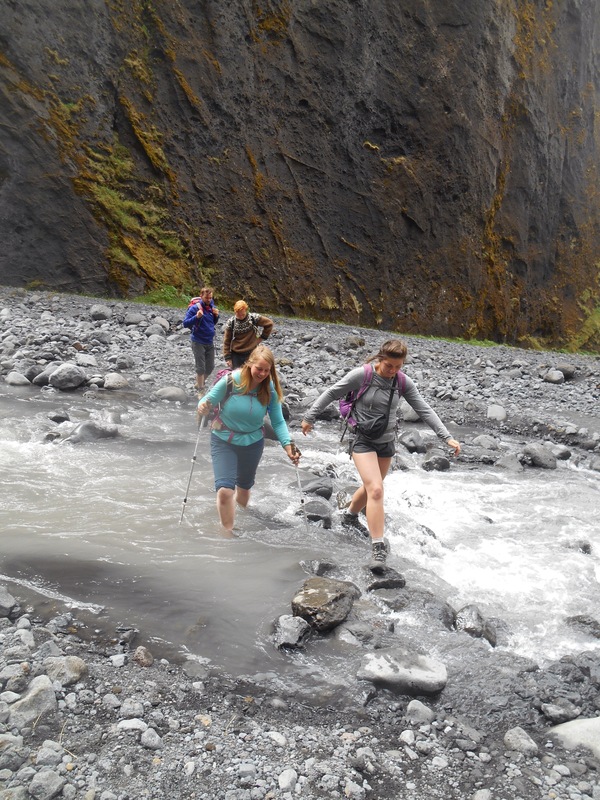 On our side of the valley however we appeared to remain sheltered so we put on our river crossing shoes, wincing as we crossed the fast flowing, glacial streams and set off to explore the hidden enclaves of the opposite mountain range. Diverting off the rustic road we followed the rocky paths crossing smaller and smaller streams towards an impressive waterfall. We were becoming smaller in contrast to the towering walls strewn with moss and greenery. At the end of the path gushes of water had formed a spiralling turret kicking out spray. As we retraced our steps Frederik was determined to avoid the river crossing and we attempted to hitch a lift back again. As we were passed by two cars we were disheartened until one of the pick ups drove across the river and then sure that they could make it, reversed back to pick us up. We split between two cars, Cat and I in the boot of one vehicle, Cal, Fred and Kylie in the car behind for the worlds shortest hitchhike. 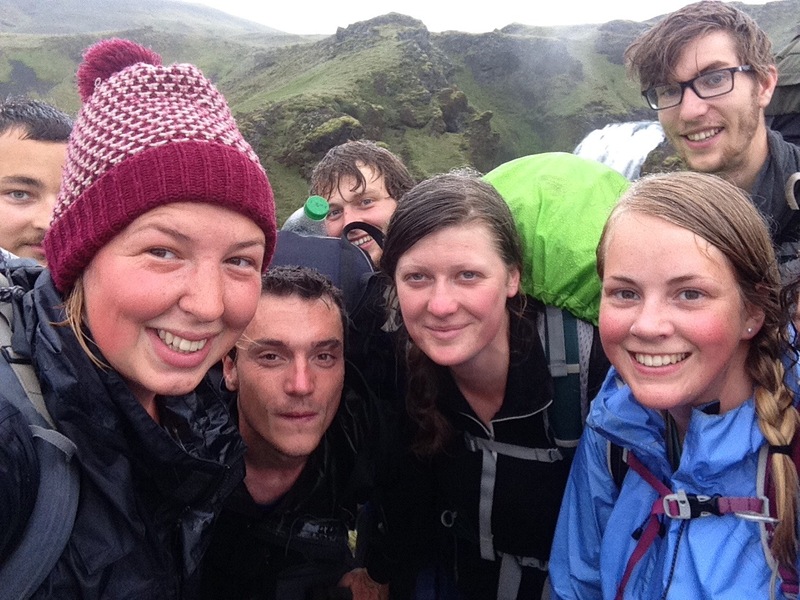 Monday’s weather was equally uninspiring and we piled to Husadalur for more cakes and rounds of jungle speed. 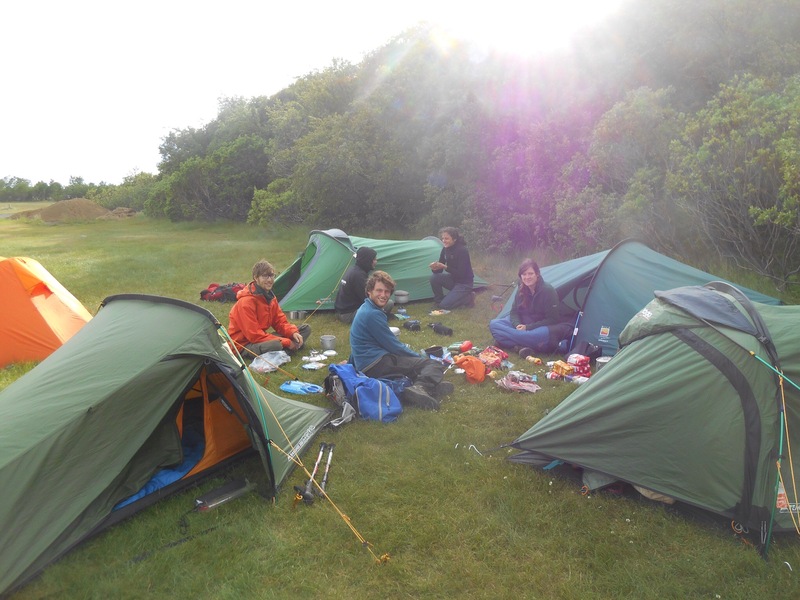 In the evening, the remaining group across the two camps joined for a joint stir fry and planning meeting about the activities the rest of the week would hold. The long hike across the park would be going ahead with the warning of potential of heavy snow still underfoot. 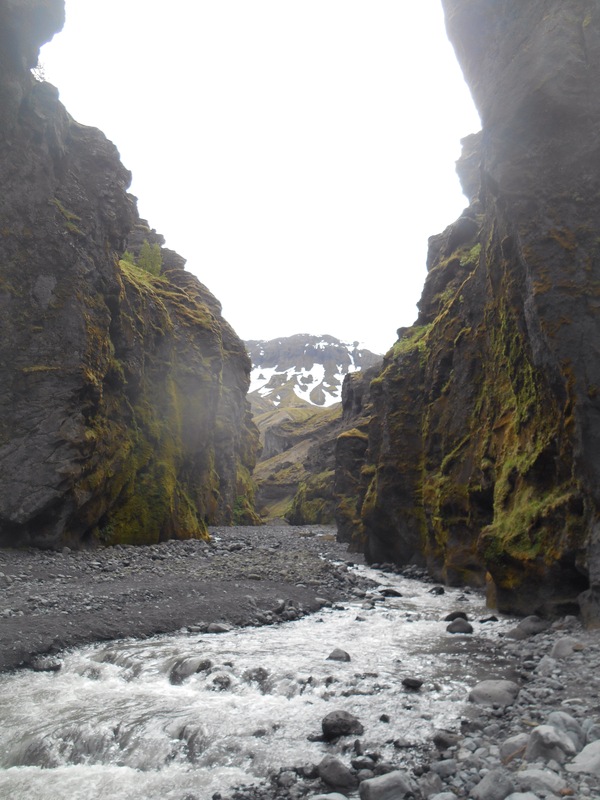 The other option was a trip to a national park in the east, Skaftafell. A quick turnaround was required on the decision and unfortunately the group would be splitting. We were invited to ‘Chas’s supermarket’ to pick out enough food in pairs for the rest of the week. Stashes of trail mix and chocolate pudding were first to go, instant packs of cous cous and noodles hesitantly awarded for each meal. 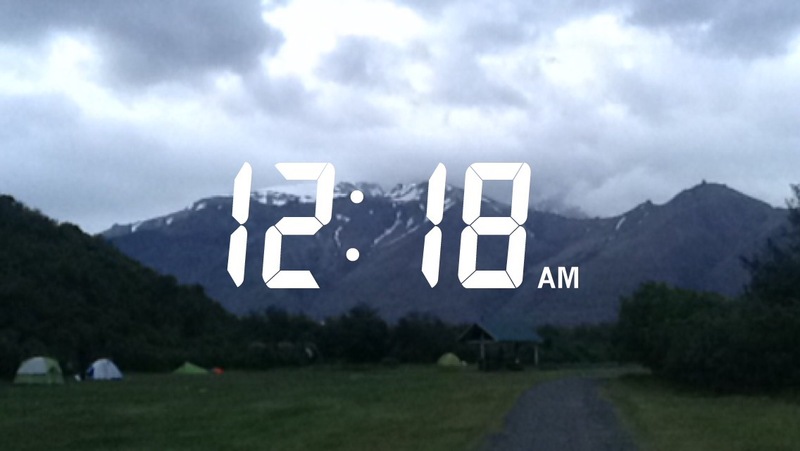 The bus left at 7:30am for Skaftafell. Despite my fail proof way of remembering gas, milk, underwear, I still had to run back to grab all three last minute. Then we had to play charades though the window to Cat as Freya didn’t have her waterproof trousers. Finally on our way we made our way out of the park on our bus which had more time sightseeing than travelling. 4 hours later we were still on the outskirts of the park having made a stop twice at Selanjafoss waterfall and at a petrol station. 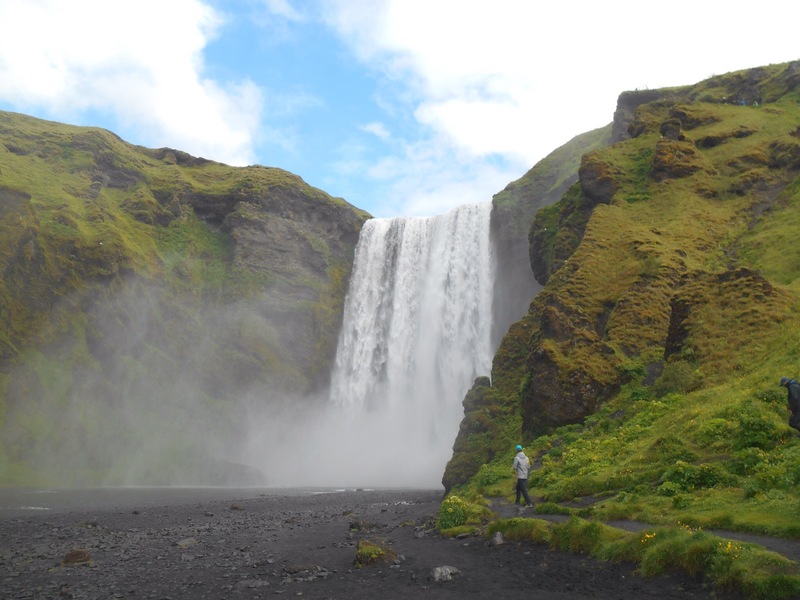 Finally heading east we had some incredible stops, firstly the mighty Skogafoss waterfall, then at a black sand beach, Reynisfjara. 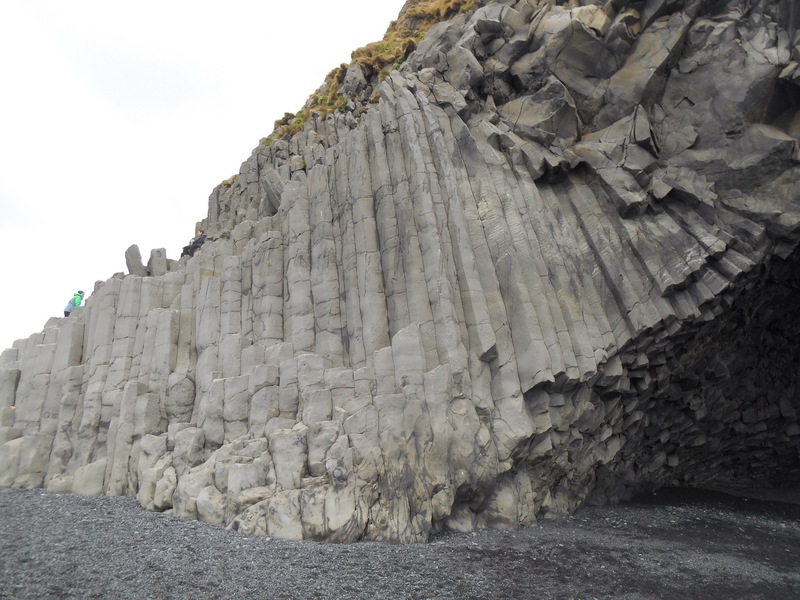 The basalt columns of the cave wall resembled Giants Causeway, building blocks like Jenga bricks or the tubes of an organ. I got pulled down the beach exploring further the strange rock formations, sometimes warped, sometimes straight like columns. Up on the cliff I saw a puffin nesting, my first glimpse of this beautiful bird. As I made my way back to the bus, having quite lost track of time, Billy approached me. The bus just tried to leave without you he said. That could have been an interesting start to the week. Understanding that the bus driver was a keen stickler for the schedule, we explored the town of Vik. The main town of the east part of Iceland comprised of two roads, a church on the hill, hemmed in by huge cliffs and a black sand beach. 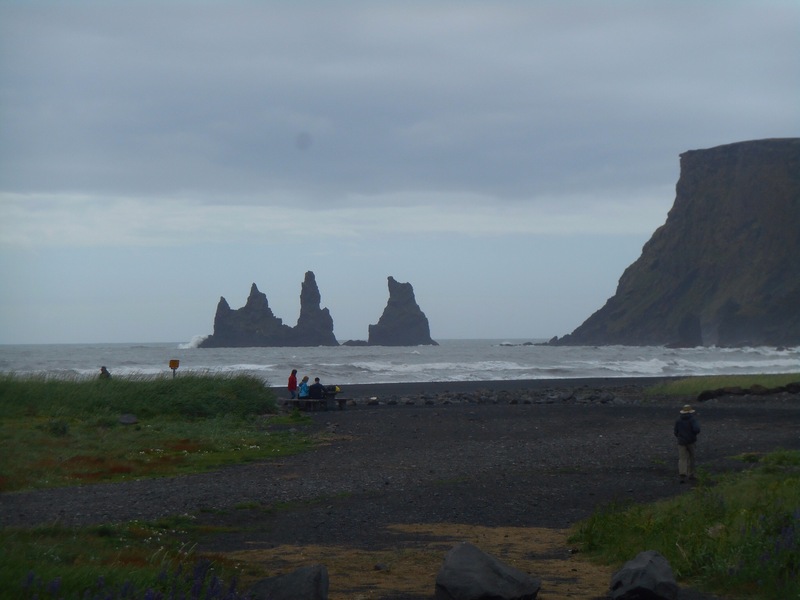 Out in the water more troll like structures jutted out of the water inspiring Iceland’s mythical storytelling. We dozed on and off waking up to moonlike landscapes, late afternoon pulling into Skaftafell national park. 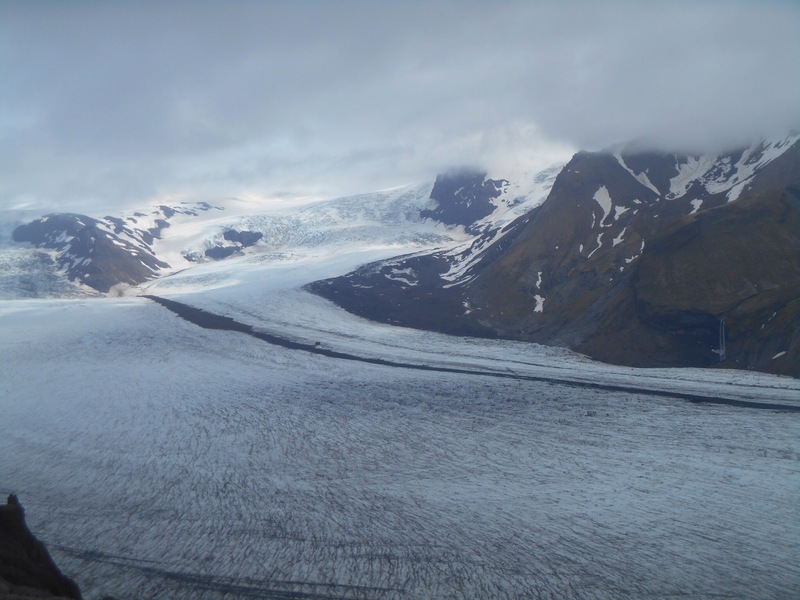 It sits on the west side of Vatnajokull glacier, a huge expanse of ice taking up a massive chunk of eastern Iceland, 8% of the country. 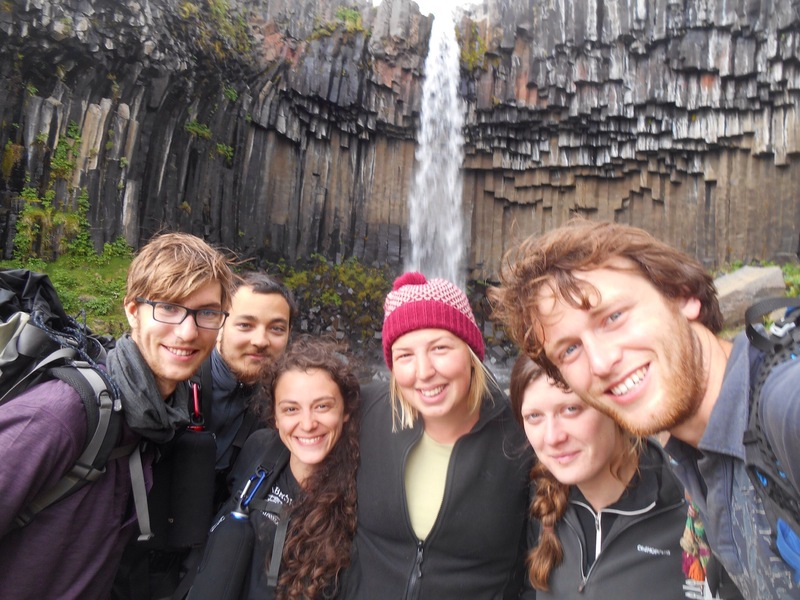 Welcomed as trail volunteers we set up our tents and made for another of Iceland’s iconic falls, Svartifoss. An easy trail took us up to the impressive falls, again with the basalt columns overhanging and a deluge of water rushing over. This symmetrical design was borrowed in the design of Reykjavik’s opera house. A makeshift meal was accompanied by lots of camping games and the introduction of Peruvian Liars Dice which quickly turned competitive. 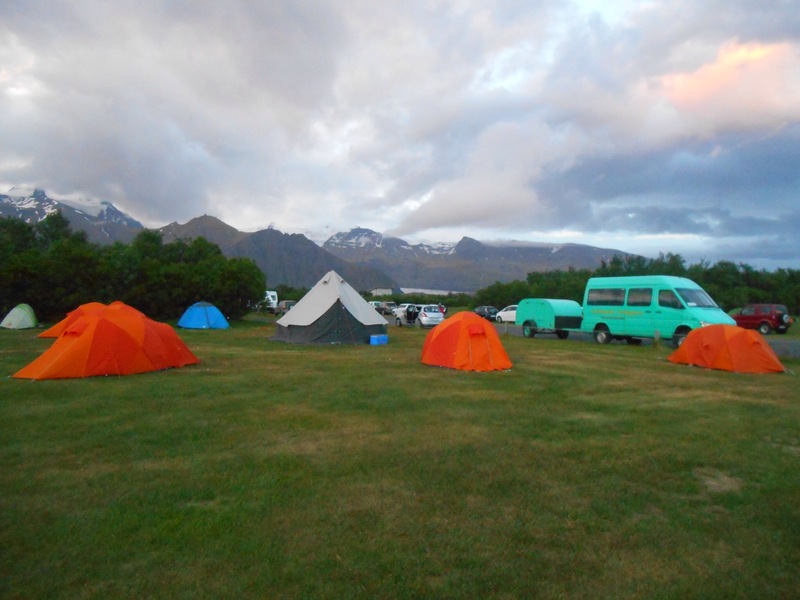 We played a prank on Lucas whose orange tent perfectly matched those provided by a tour group just across the field. At an opportune moment we dragged his tent to join their group, stifling a giggle as he returned to play along with the joke a pretend he hadn’t noticed. It was the summer solstice, the height of Iceland’s midnight sun, and despite having not seen darkness since flying out of the U.K. over a month ago, we decided to stay up for the phenomenon. Shortly before midnight we took a walk up the hill to watch the sun, still high in the sky, although hidden by cloud, as the clock struck midnight. Far from a week of holidaying we had a network of hikes we wanted to complete. The first day we would be climbing Kristinatindar, the highest mount in the area. Having mentioned my bad map reading I was given the leader duties and may have slightly concerned the group by announcing that west had changed direction. 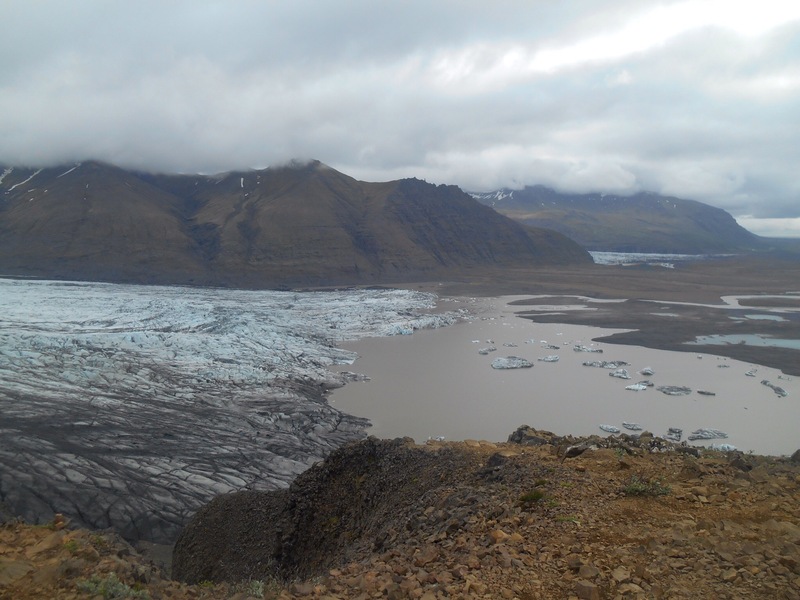 The trail followed the side of the glacier which formed in the valley between the two mountains. 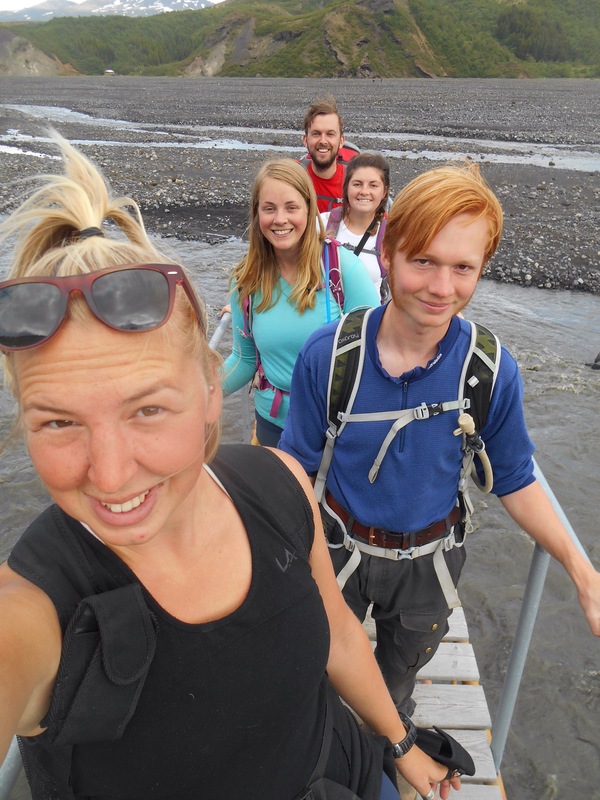 We passed Skaftafell’s trail team and were the first customers on their new steps. Our lunch stop was on a rock plateau, the mountain path ascending behind us, red rock and the glacier below. As we began climbing the fog rolled in around us. The scree slope was a rainbow of colours, broken away from the rock face in neat stripes. From the top we got occasional windows to the valleys either side. The next day we explored the other valley, walking along a sheltered path through Morsadalur to another glacier with a powerful waterfall feeding into it. 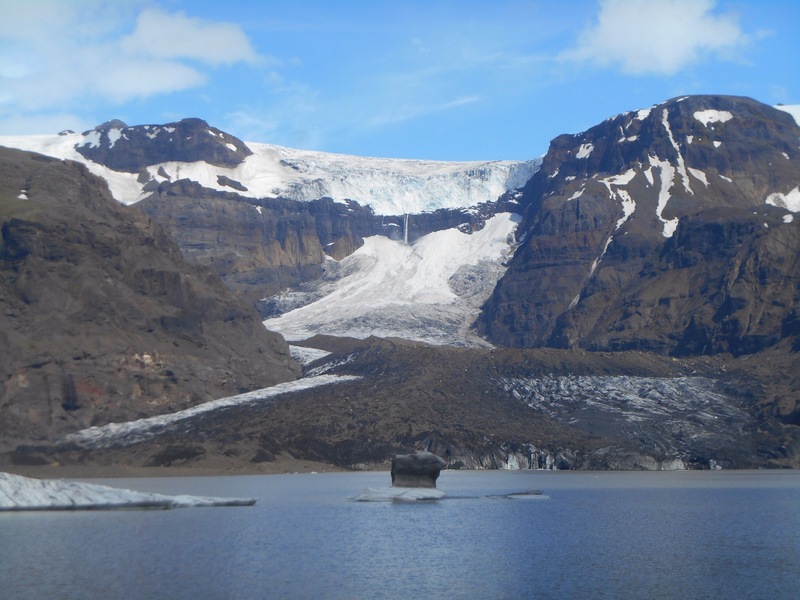 This vast ice face ended in a glacial lake with breakaway icebergs. 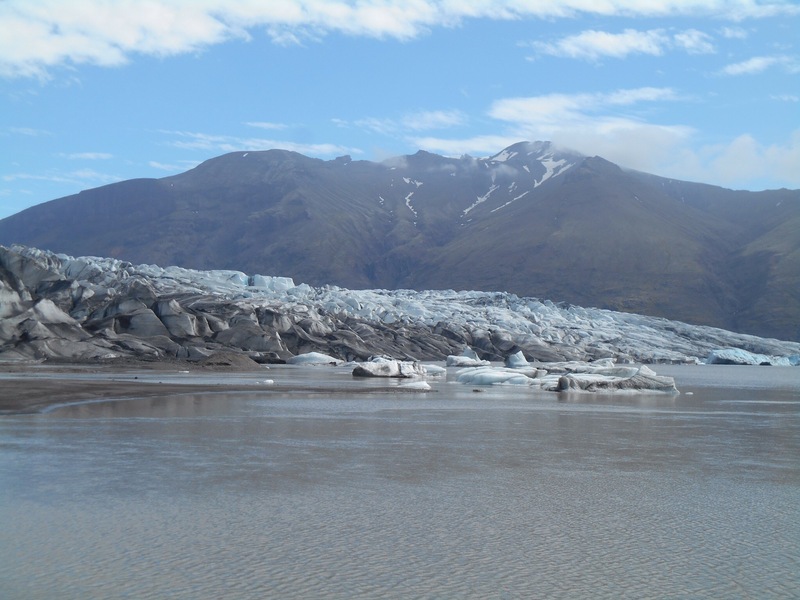 The icy blue breakaways slowly moved around each other, resembling different shapes and animals. 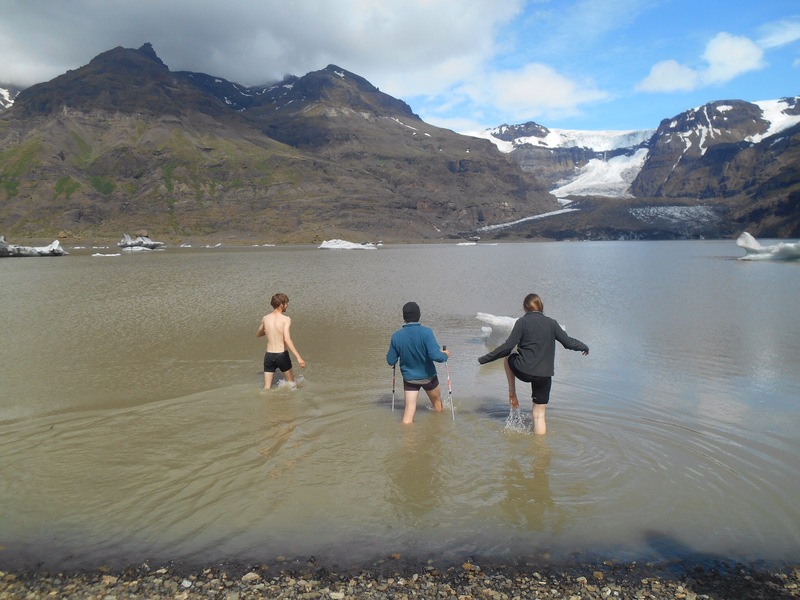 For some of the group the icy water was tempting and first strode in to touch the closest berg, then invigorated some of the others stripped off for a swim. I enjoyed the screams of cold from a sunny spot on the bank. 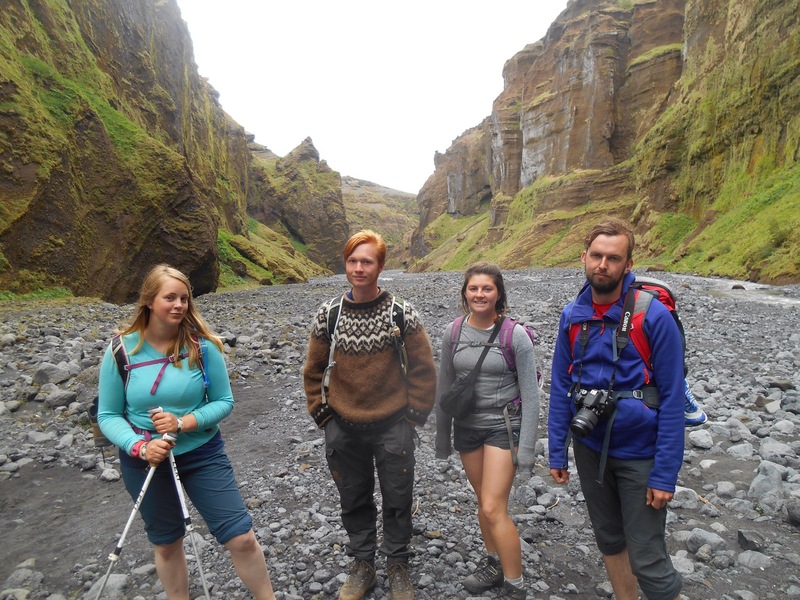 As we retraced our steps past waterfalls and troll like rocks, stopping to take photos impersonating trolls and even a trelfie. All to soon it was our last day. A short walk took us to a closer glacial lagoon with very large and dramatic icebergs breaking away from the jagged glacier edge. 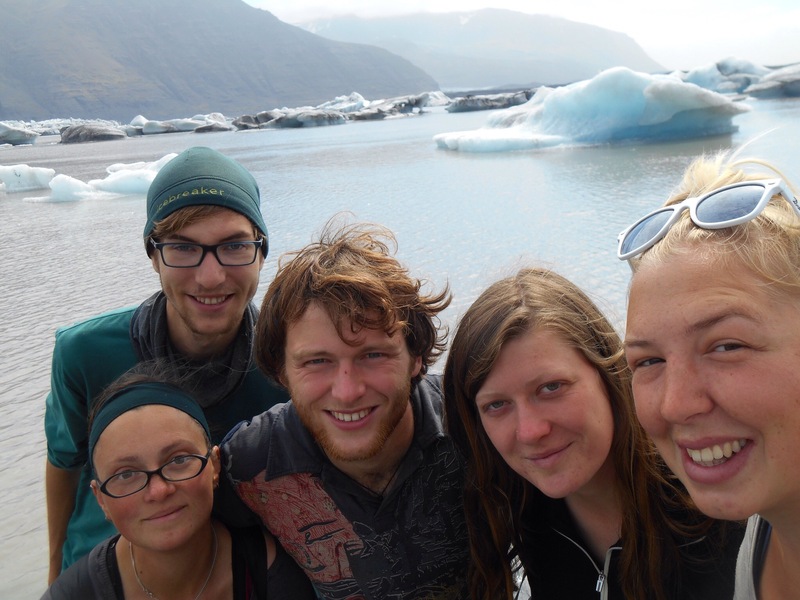 It was amazing to be up as close to the glacier which stretched out vast in front of us. 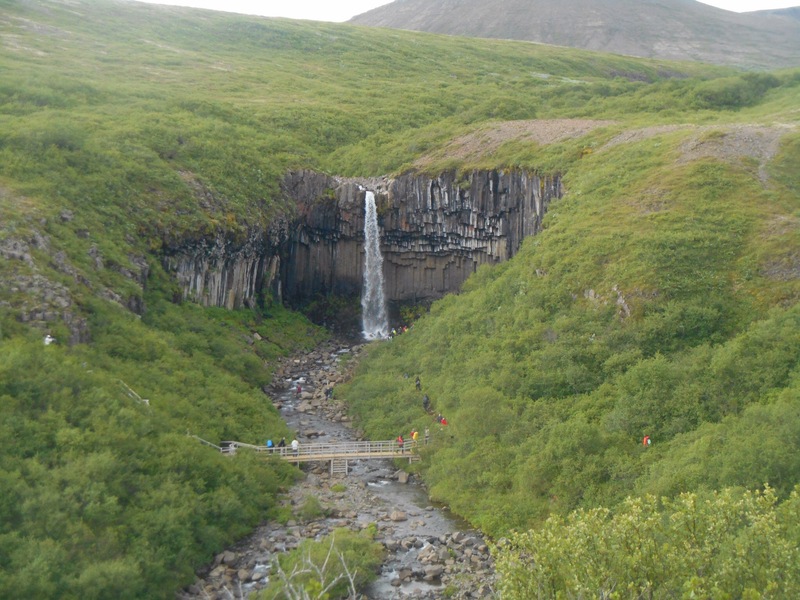 The bus journey took us back east and by late afternoon we were at Skogar ready to begin our hike back into Thorsmork. This time daylight was on our side as with no night, there was no vision restriction, but climbing up to the top of the 60metre waterfall and with much more climbing to go, we were walking into a cloud. 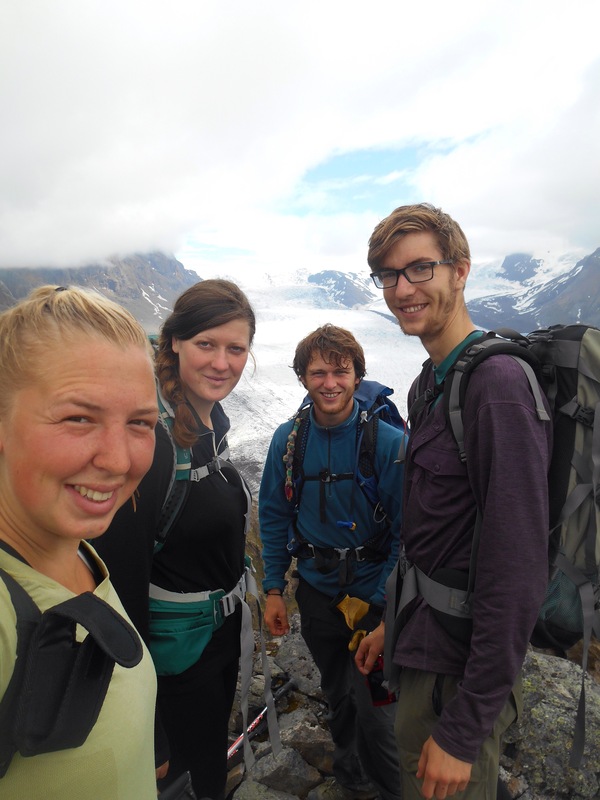 We planned to walk to Baldvinsskali hut to spend the night, 12km into our 26km hike. With 1000 metres to gain, most of the walk was a not so steady climb but with over 20 dramatic waterfalls to steal our attention, the walk was dramatic and eerie with the hanging mist. By the time we reached the hut it was gone nine and the hut was crowded with campers and hikers alike. As the hut emptied out we transformed the ground floor into a den with mattresses in a line and as we got tucked up began telling scary stories line by line with each person contributing something. This may have amounted to more of a comedic rather than scary effect. In the morning the mist hung around giving a dramatic start to our walk through the Fimmvörduháls. 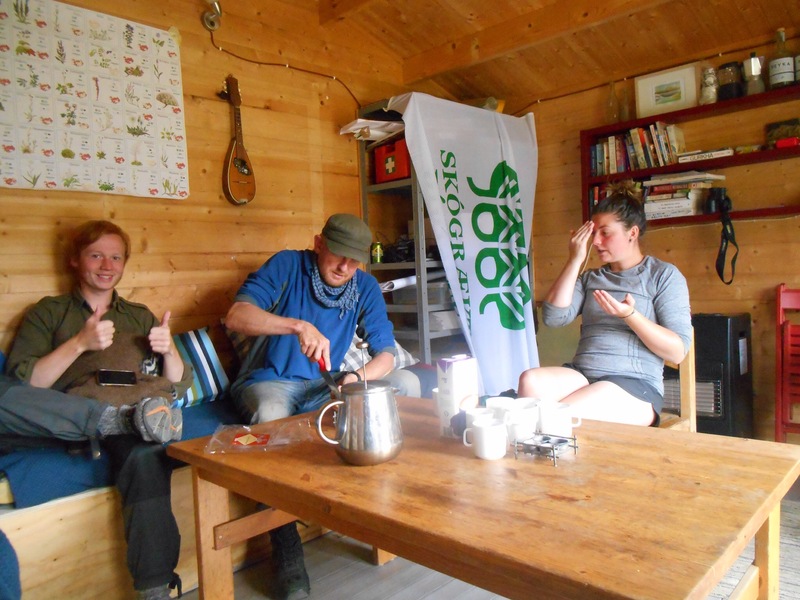 It had the feel of a ski hut as we all wrapped up warm and set off across snowy terrain into the heights. 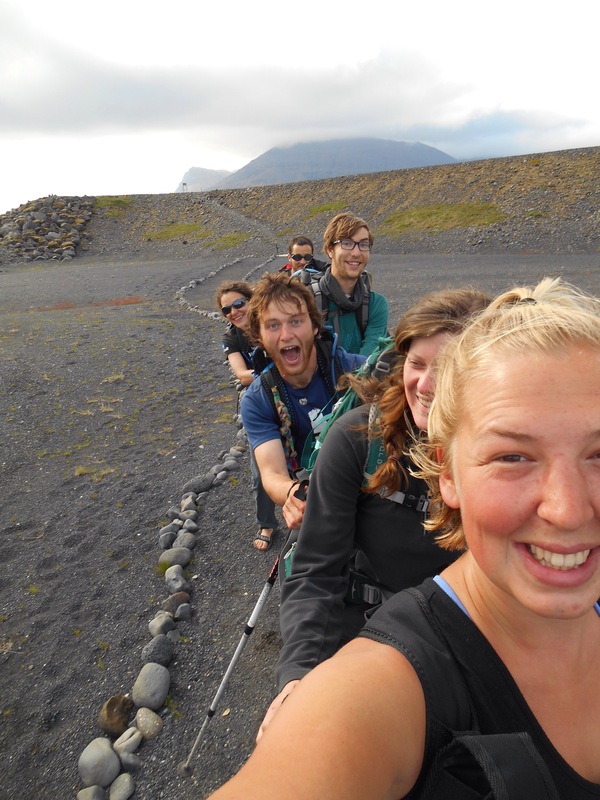 Peaking at around 1000 metres we began to descend past two lava fields created in the 2010 eruption. Out of the clouds we began to follow a winding ridge through cooled lava and snow, eventually into greenery, craggy mountains and camp visible in the distance beyond. With a week complete, new friendships had been strengthened and personal spaces diminished. We had clocked a hefty amount of kms. 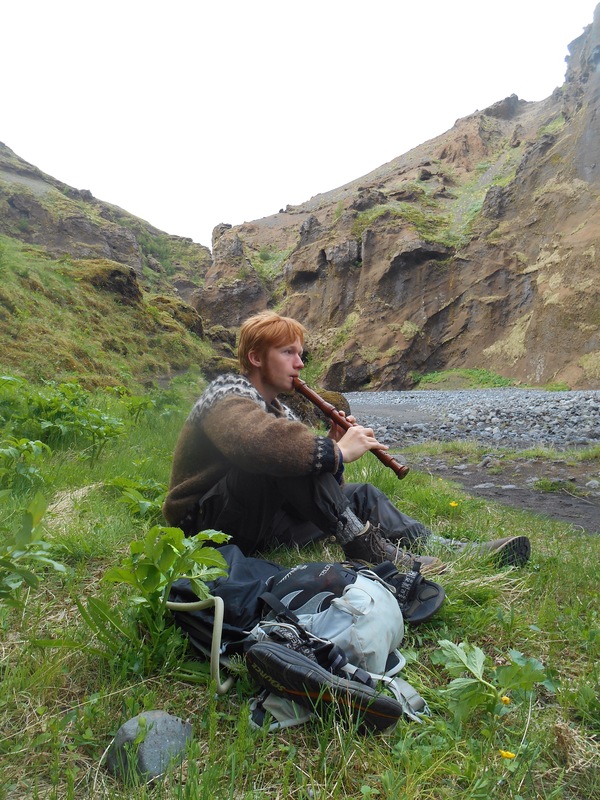 Iceland had shown us hat impressive glaciers, mountains and waterfalls were commonplace, as was scarves and sunglasses in the same day. Supernoodles need not be boring and there is always room to experiment with wraps. Now it was time for us to earn our keep once more. An amazing week of hikes and glaciers. I would also have opted to sit on the bank while the crazies went for a freezing cold swim. 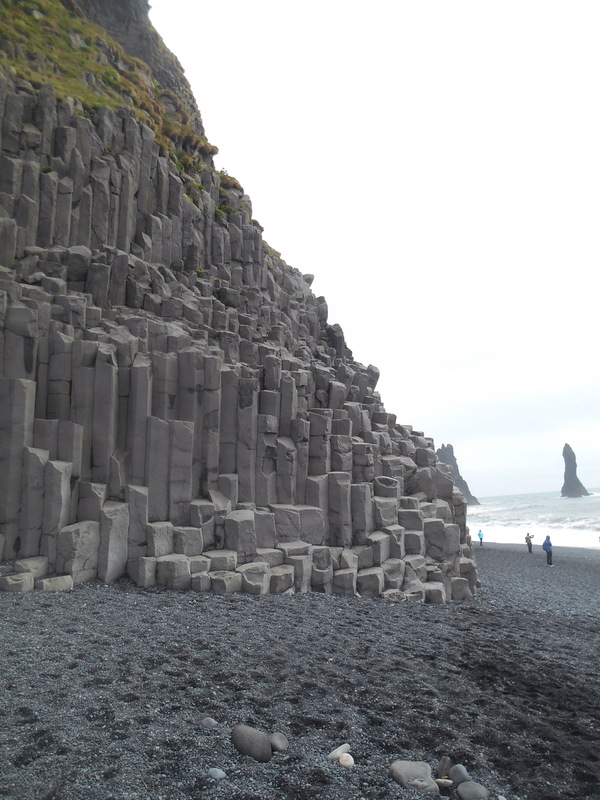 Iceland is stunningly dramatic and you’ve really seen it up close and personal.